Need your new bell installed? You're in luck! We do installation right here in our shop. For only $129 you can have your new bell installed on your horn by one of our skilled Repair Technicians and shipped back to you. Bells are constantly coming in and leaving our shop. If your bell is currently in-stock, allow 3-4 business days for us to install your new bell and ship it back to you. If your bell is not currently in-stock, please allow 4-6 weeks for us to get your bell to our shop. 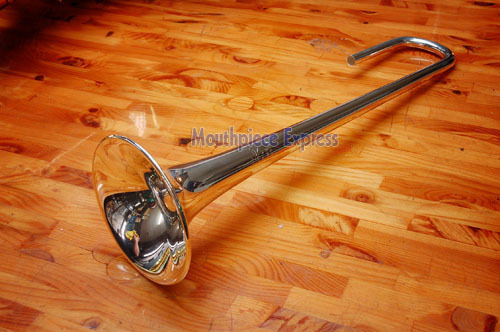 *Please Note: Price includes the difference in shipping and insurance for your trumpet. This price does not include any lacquer for your new bell. Installing a new bell may leave minor cosmetic blemishes and/or solder spots that lacquer usually hides. 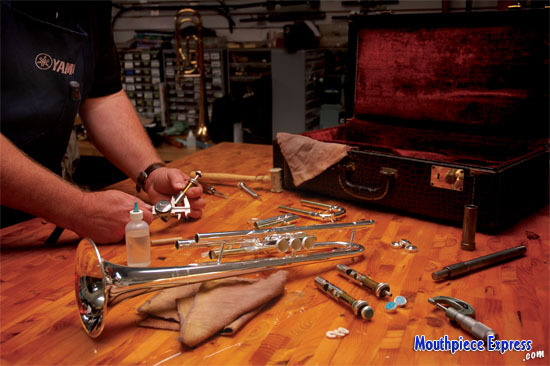 Contact Us if you'd like to have lacquer added to trumpet after installation. Please review our Returns and Audition policy regarding bells before purchasing. Now that you've got your shiny, new bell do you need to get rid of your old one? We'll give you money for your old bell! If you elect to have us install your new bell we can inspect it then. If you choose to have your bell installed at a local shop, simply send us some photos and we'll get back to you with an offer. Soon you'll be able to have your new bell engraved with one of our cool custom designs! Check back soon for more details.